Importan Note: If you are updating from version prior to 0.4.0, you have to delete data and configuration at /home/nemo/.config/harbour-fuoten and /home/nemo/.local/share/harbour-fuoten! Simply delete these folders. Fuoten is the successor of ocNews, and as ocNews, it is a client for the ownCloud/Nextcloud News App. This is a development preview. It should be stable but lacks some of the features of ocNews. There is currently no optimized UI for tablets, so the current version only supports phones. I just noticed that Fuoten doesn't sort the articles according to the creation time of the article, but according to the synchronization time. This is useless if you only synchronize manually and then have a lot of articles per feed. I suggest an option: when I select "mark as read /unread" from pull-down menu, I'd like fuoten goes back to the previous page (pagestack.navigateBack). Thanks a lot. Mark a feed as "Very Important". Contents of this feeds are always displayed at the top until they are read or scrolled away. This would prevent particularly interesting feeds from getting lost in the mass of news. If you view/read chronologically. Do you mean in the all articles/complete folder views? There is currently the sticky bit for feeds, but it is only changeable via web interface because there is no API route for it. But it only show the feed itself in front of other feeds. I could use this to also show the items in front of the rest. But it would not be setable from the app. Otherwise I could only implent it in the app but that would not be reflected on the server. At least it doesn't matter which approach I use, it would not be synchronizable. :) So, what do you think would be the better approach? I read exclusively in the app and would be happy about this function in the app. +1 for "mark as read once you scroll past them"
I am migrating away from Google and have installed NextCloud News for my current 161 feed subscriptions. Since the Google Reader was switched off in 2013, I've been using Feedly with Google Log-in. Great application! Thank you very much for it! Works very well on my Xperia X Compact with Sailfish 3.0.0.8 in conjunction with Nextcloud 14. Three things: First, dates aren't all properly displayed for me "libfuoten-yesterday". Second, would it be possible to add scroll tracking, so articles get marked as read once you scroll past them? 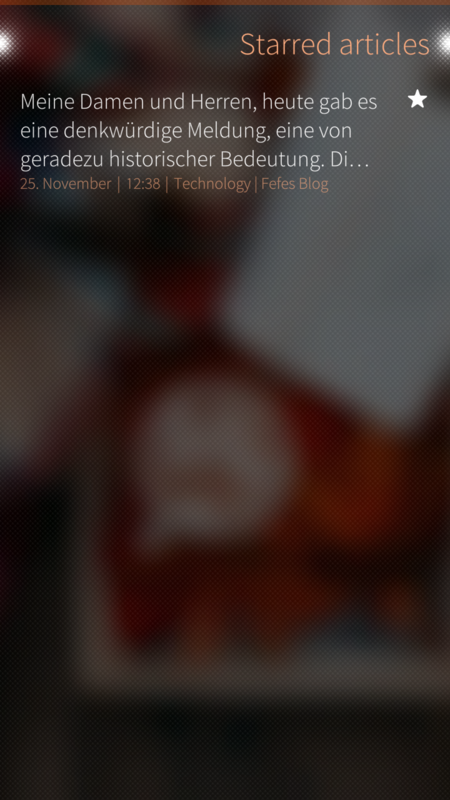 Third, on the X Compact text in portrait mode in the "All Articles" view is displayed wider than the display. To the first: What language are you using? What language has been set in the Fuoten settings? Not all languages are completely translated. But normally than the English string should be shown. To the second: Nice idea. Will implement something like this. To the third: Can you upload a screenshot somewhere? On my Jolla and on my Xperia X, all looks as it should. I am also happy to hear that you like the idea of scroll tracking! This will make reading news on Sailfish even more enjoyable than it already is! Hey, I just uploaded version 0.6.4. Please chek, if that fixes your issues. Wow, thanks for the quick update! Nice to hear. :) I otherwise would have proposed that you completely reinstall the app. Does the app still works OK with Sailfish 2.2? I ask because in my case it seems to have issues with SSL login. If I enable HTTP access to my nextcloud instance, it can login ok and read news articles, but if I allow only HTTPS access , the app throws a "SSL/TLS handshake failed" error. However, HTTPS access should be OK, because e.g. Ghostcloud (Sailfish app) can do HTTPS login from the same device and access the nextcloud folders. Hm. I was using it all the time on any release - now on 3.0.0.8 - and newer had this issue. Is the issue still alive for you? If yes, it would be good if you could create a test account on your Nextcloud instance for me and send me the auth data via private message. Hey, which version are you using? Hello babba22, I just uploaded version 0.6.2 that should fix that issue. Thank you for reporting. Sadly the app still does not start..
Hm, I can not reproduce it. Can you please try deleting ~/.local/share/harbour-fuoten and ~/.config/harbour-fuoten ? Can you please update to versino 0.6.1? (Available her) :) There was a regression in 0.6.0 that has been fixed in 0.6.1 - sounds like your issue. Hi, it don't work for me. The notification show me I hahe 23 unread article and in app I can't read any thing (i have 0 article). With the same conf all work well with ocnews. Wat log do you want? Great app! It already works very well, even if it has BETA status :D Good job!